PWCrate has several options to fit your budget. There are three main options for subscribers. With the Original crate, you get one t-shirt. Another new option is the Tag Team box, which comes with two t-shirts. The third option is the Triple Threat, which comes with three t-shirts. These boxes will all come with a signed 8×10 from a wrestling legend or indie wrestler. They will also include other items such as DVDs, art prints, buttons, pins, stickers, and more. Depending on the length of your subscription, you can purchase these boxes for as low $14.95-$34.95 depending on which crate you choose plus shipping. Keep in mind that if you get the Tag Team or Triple Threat crate, only the first shirt is tied into the monthly theme. 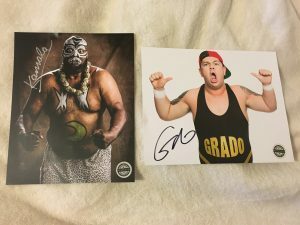 There is also a Cheap Heat box for $9.99 that includes an autographed 8×10 from a legend or indie wrestler and two of the collectibles from the regular boxes. Finally, PWCrate has introduced a new option called a Mid Card box for 14.95 plus shipping. This box will get you a shirt designed by Pro Wrestling Tees and a signed 8×10 from an indie or legend wrestler. If you’re a big wrestling fan, the Triple Threat tier is the way to way to go. PWCrate is really doing a fantastic job of generating different themes. This month the three shirts were all tied into the theme of the month and they knocked it out of the park, especially with the Mick Foley & Terry Funk Japanese death match shirt, which features an insanely great design. 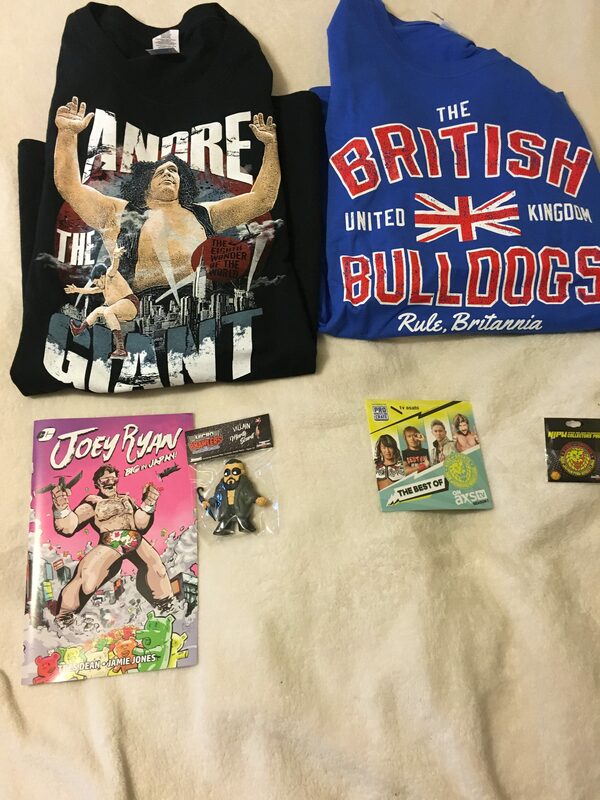 PWCrate continues to set the standard for pro wrestling mystery boxes. The crate this month was fantastic. The Across the Ocean theme had two shirts that were homeruns with Zack Sabre Jr. and British Bulldogs. I liked the Andre The Giant in Japan shirt, but the large graphic on the front was a bit much for my tastes. I tend to like wrestling shirts with simpler designs. The collectibles in the box were really good this month. There was a high quality NJPW logo pin, a Joey Ryan Big in Japan comic book, a Marty Scurll Micro Brawler, and a Best of NJPW on AXS: Season 1 DVD. With the shirts and collectibles I’ve mentioned, you’ve already gotten double your money’s worth. The NJPW on AXS DVD is an incredible get for PWCrate, as I’ve always believed AXS should release Blu-ray versions of the NJPW on AXS shows in stores or online. I won’t complain if they continue to release NPW on AXS DVDs in the monthly crates. PWCrate usually only gives you one autograph, but this month they included two signatures. I’m not a big fan of Grad0, but I know that he is a popular international star. I really was thrilled to see a Kamala autograph included along with Grade, as Kamala was a larger than life wrestler to me when I was a child. There are several pro wrestling mystery boxes on the market now. In my opinion PWCrate is the best. The shirts are fantastic and you get a ton of value for your money. These boxes sell out fast and the next box is nearly sold out, so act fast. The cutoff date for the next box, “Professions,” is Sept 15. Do not hesitate to order your crate, as they sell out extremely fast.